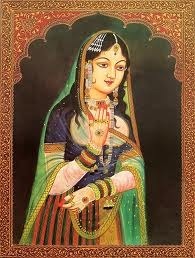 The tomb of Enticing Lal Kunwar- a dancing girl destined to be a queen. This Mughal color-wash drawing, Walters manuscript leaf W.712, dates to the12th century AH/AD 18th and depicts Lal Kunwar, the beloved of the 8th Mughal Emperor Jahandar Shah (died 1125 AH/AD 1713). The seals in the upper corners of the page were added later. Walters Art Museum, 1931, by bequest. Lal Kunwar was the consort of Jahandar Shah (1661–1713) Mughal Emperor who ruled India for a brief period in 1712–1713. His title was Shahanshah-i-Ghazi Abu’l Fath Mu’izz-ud-Din Muhammad Jahandar Shah Sahib-i-Quran Padshah-i-Jahan (Khuld Aramgah). Jahandar Shah, led a frivolous lifestyle, his court echoed with sounds of dancing and entertainment. In a besotted state he chose Lal Kunwar, as a favourite wife and elevated her to the position of Queen Consort. This shocked the Mughal Empire and they were even opposed by Aurangzeb’s surviving daughter Zinat-un-Nissa. 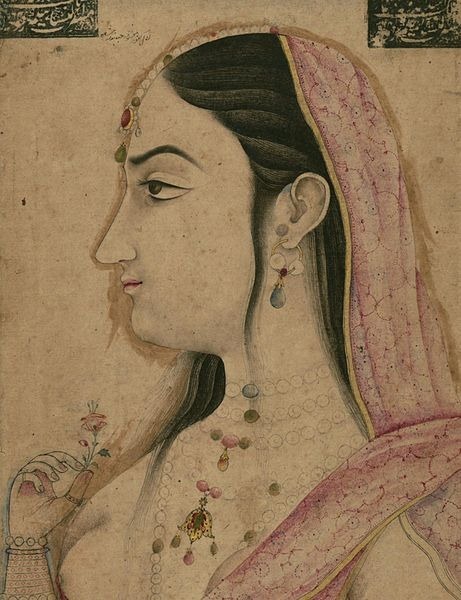 Lal Kunwar, the beloved of the 8th Mughal Emperor Jahandar Shah (died 1713) was originally a dancing girl, she became Jahandar’s concubine and later the queen consort. Jahandar Shah’s decadent lifestyle and his devotion to the female entertainer Lal Kunwar, is recorded by contemporary historians. Lal Kunwar had much influence at Jahandar’s court. Lal Kunwar was from Punjab and belonged to the family of Tansen, the famous singer at Akbar’s court, revered to this day. 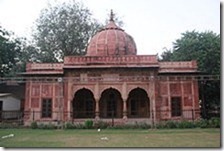 Lal Bangla, located in Nizamudin Delhi, and has a set of two tombs made out of red and yellow sandstone. One of the tombs contains two graves, believed to be that of Lal Kunwar, the mother of Shah Alam II(1759-1806) and his daughter Begum Jahan. 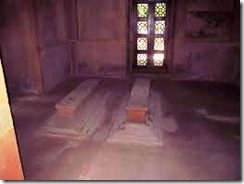 Both mausoleums consist of square rooms at diagonals with oblong halls between them. The mausoleum stands on a red sandstone platform with rooms at corners. The dome of the mausoleum is in the late Mughal style and has a pinnacle at the top. Also located within the complex is the tomb of Syed Abid, which was built in 1036 AH ( approx. 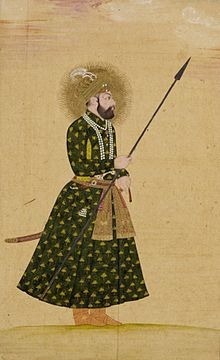 1626 CE) He was a companion of one of Jahangir’s generals, Khan-e-Dauran Khwaja Sabir Nusrat. The tomb was built in 1626-27. Jahandar Shah was fond of dance and music and beautiful women. He was not a good king nor an administrator. Delhi was plunged into utter chaos and misrule during his reign. Mostly it was due to Lal Kunwar, a dancing-girl whom he married later, giving her the supreme position of Empress. She had him under her thumb and soon became the real power behind the throne. Jahandar Shah addressed her as “the form of an angel and the voice of a nightingale.” But when Lal Kunwar protested, saying that she is only a slave, he announced that henceforth she would be known as Begum Imtiaz Mahal. Lal Kunwar had said, “But I shall have to live in the palace then. ..How will I see Zohra ?” The king enquires who Zohra is. Lal Kunwar replies, “Zohra ? She is my best friend. She sells water-melons… the sweetest water-melons in Delhi.” The king appointed Zohra as her chief lady-in-waiting, so that she might live in the palace with her. Then Lal Kunwar asks, “But what about Niyamat? He is my brother and plays the Sarangi.” The king appointed Niyamat the Governor of Multan! All the brothers and relatives of Lal Kunwar close and distant, received ‘Mansabs’ of four or five thousand, presents of elephants, drums and jewels. There is an interesting story according to which Zulfikar Khan, the Emperor’s wazir, is said to have demanded 1,000 sarangis as bribe from the brother of Lal Kunwar. When the Emperor asked him what he was going to do with so many sarangis, the wazir told him that since sarangi players were being made Governors, he wanted to present a sarangi to each of the nobles in the Empire, so that they too might qualify themselves for the service of the Emperor! In the words of another historian: “Lal Kunwar’s brothers and relations swaggered through the streets, committing every kind of outrage while the Emperor gave himself to drinking and other vices.” Jahandar Shah came to be known as the “Lord of Misrule”. The once glorious Diwan-i-Khas was reduced to a farcical emblem from where one foolish decree followed another. Lal Kunwar, although beautiful and skilled in singing, was prone to crazy whims, many of them brutal and heartless, and Jahandar Shah gave in to all of them. When she remarked one day that she had never seen a boat sink with people drowning Jahandar Shah immediately ordered a boat to be taken to the Yamuna and made to sink. So that Lal Kunwar might watch the agony of the drowning people! When she said that she was curious to know what the Faiz canal would look like without the trees on both sides, the Emperor ordered the trees to be felled down immediately. 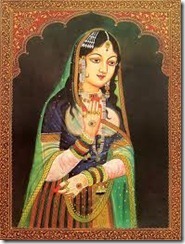 Jahandar Shah had given all authority to her and she had started using that power according to her. She started appointing her close men to top posts and whenever she used any where more 500 bodyguards used to travel with her. All the brothers and relatives… of Lal Kunwar received mansabs of four or five thousand… and were raised to dignity in their tribe. Naturally, talented and learned men were driven away from the court. Zohra was a melon seller and a friend of Lal Kunwar. 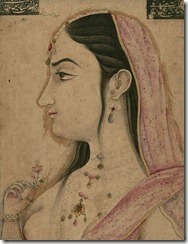 At the latter’s instance she was called into the harem by Jahandar Shah. She was highly ambitious and scheming like Lal Kunwar. However, Lal Kunwar alone cannot be blamed for these follies. The besotted Emperor who gave these crazy orders should be blamed equally. The only thing that may be said in Lal Kanwar’s favour was that she was truly devoted to Jahandar all her life and had once saved his life in the battlefield when he was badly wounded. She rushed to the field on her own elephant and carried him to safety, looking after him until he was able to resume fighting once again. 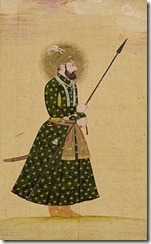 Jahandar Shah was defeated at the Second Battle of Samugarh near Agra on 10 January 1713. Following this, the Sayyid Brothers, helped Farrukhsiyar to secure his throne. He took the throne On 11 January 1713, at the age of 30. Jahandar Shah’s reign was short-lived. His nephew Farrukhsiyar who entered Delhi in a procession on February 12, 1713had him strangled him to death, by professional stranglers. It is recorded when the ‘men of doom’ came Lal Kunwar had shrieked and clasped Jahandar Shah round the neck and refused to let go. They were violently forced apart and Jahandar Shah was killed. Lal Kunwar was sent to the settlement of Suhagpura where the widows and families of deceased emperors lived in retirement. Thus ended the saga of Lal Kunwar, the nautch girl who rose to be an empress. All that remains is her tomb-Lal Bangla. This entry was posted in History and tagged Jahandar Shah, Lal Bangla, Lal Kunwar. Bookmark the permalink.